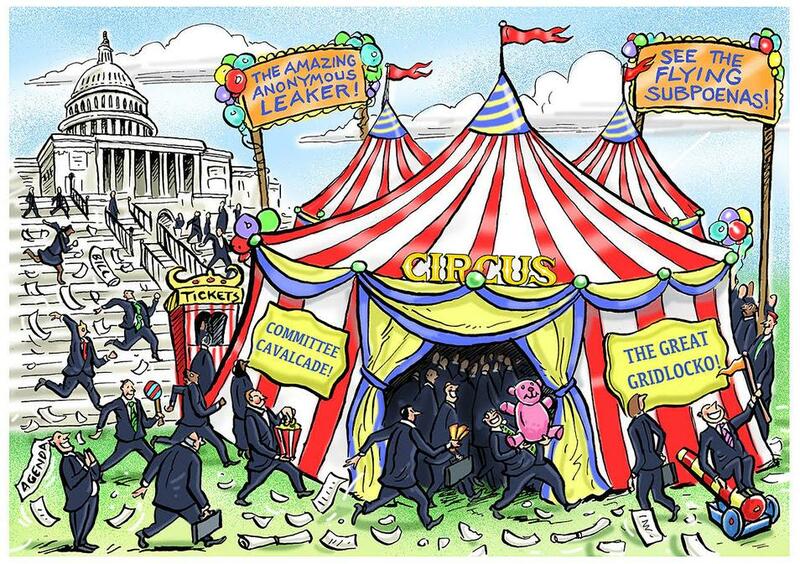 When the circus comes to Washington, it consumes everything, absorbs all energy. Democracy is not your plaything. The president of the United States has produced a building crisis that is unprecedented in our history. The question, at bottom, is whether Donald Trump has demonstrated, in his first four months, that he is unfit for the presidency—wholly unsuited in terms of judgment, knowledge, mental capacity, personal stability. That epic question is then broken down into discrete and specific questions: Did he improperly attempt to interfere with an FBI criminal investigation, did his presidential campaign collude with a foreign government, etc. But the epic question underlies all. It couldn’t be more consequential and will take time to resolve. The sheer gravity of the drama will demand the best from all of us. Are we up to it? But he was duly and legally elected by tens of millions of Americans who had legitimate reasons to support him, who knew they were throwing the long ball, and who, polls suggest, continue to support him. They believe the press is trying to kill him. “He’s new, not a politician, give him a chance.” What would it do to them, what would it say to them, to have him brusquely removed by his enemies after so little time? Would it tell them democracy is a con, the swamp always wins, you nobodies can make your little choices but we’re in control? What will that do to their faith in our institutions, in democracy itself? But if Mr. Trump is truly unfit—if he has demonstrated already, so quickly, that he cannot competently perform the role, and that his drama will only get more dangerous and chaotic, how much time should pass to let him prove it? And how dangerous will the proving get? Again, wrenching questions. So this is no time for blood lust and delight. Because democracy is not your plaything. The president’s staffers seem to spend most of their time on the phone, leaking and seeking advantage, trying not to be named in the next White House Shake-Up story. A reliable anonymous source who gives good quote will be protected—for a while. The president spends his time tweeting his inane, bizarre messages—he’s the victim of a “witch hunt”—from his bed, with his iPad. And giving speeches, as he did this week at the Coast Guard Academy: “No politician in history, and I say this with great surety, has been treated worse or more unfairly.” Actually Lincoln got secession, civil war and a daily pounding from an abolitionist press that thought he didn’t go far enough and moderates who slammed his brutalist pursuit of victory. Then someone shot him in the head. So he had his challenges. Journalists on fire with the great story of their lives—the most bizarre presidency in U.S. history and the breaking news of its daily missteps—cheer when their scoop that could bring down a president gets more hits then the previous record holder, the scoop that could bring down the candidate. Stop leaking, tweeting, cheering. Democracy is not your plaything. There’s a sense nobody’s in charge, that there’s no power center that’s holding, that in Washington they’re all randomly slamming into each other. Which is not good in a crisis. We’re chasing so many rabbits, we can’t keep track—Comey, FBI, memoranda; Russia, Flynn, the Trump campaign; Lavrov, indiscretions with intelligence. It’s become a blur. But there’s an emerging sense of tragedy, isn’t there? Crucially needed reforms in taxing, regulation and infrastructure—changes the country needs!—are thwarted, all momentum killed. Markets are nervous. The world sees the U.S. political system once again as a circus. Once the circus comes to town, it consumes everything, absorbs all energy. It is absurd to think the president can solve his problems by firing his staff. They are not the problem. He is the problem. They’re not the A-Team, they’re not the counselors you’d want, experienced and wise. They’re the island of misfit toys. But they could function adequately if he could lead adequately. For months he’s told friends he’s about to make big changes, and doesn’t. Why? Maybe because talented people on the outside don’t want to enter a poisonous staff environment just for the joy of committing career suicide. So he’s stuck, surrounded by people who increasingly resent him, who fear his unpredictability and pique and will surely one day begin to speak on the record. A mystery: Why is the president never careful? He doesn’t act as if he’s picking his way through a minefield every day, which he is. He acts like he’s gamboling through safe terrain. Thus he indulges himself with strange claims, statements, tweets. He comports himself as if he has a buffer of deep support. He doesn’t. Nationally his approval numbers are in the mid to high 30s. His position is not secure. And yet he gambols on, both paranoid and oblivious. History is going to judge us by how we comported ourselves in this murky time. It will see who cared first for the country and who didn’t, who kept his head and did not, who remained true and calm and played it straight. Now there will be a special prosecutor. In the short term this buys the White House time. Could it help? For a minute. But it would be constructive—not just carping, leaking, posing, cheering and tweeting but actually trying to lead. The president needs to be told: Democracy is not your plaything. DHS Gen. Kelly: Illegals SCAMMING U.S.
After the Confederates, WHO"S Next? Trump Budget Blasted as Kid-Killing — SERIOUSLY? REGIME CHANGE by Any Other Name? At UCSC, Throw the BLACK ACTIVIST Bums OUT!